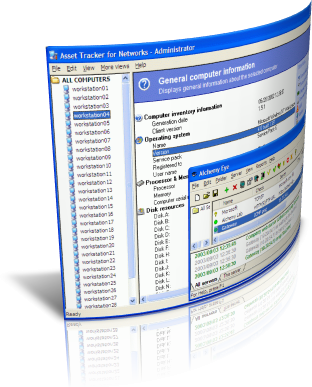 The first toolkit component, Asset Tracker for Networks, is a network inventory tool intended to audit software and hardware components installed on the computers over the network. This asset management tool will collect your network inventory information, provide the Network Administrator with the detailed comprehensive reports and allow you to export assets details to external storages, such as SQL database or web site. The second component, Alchemy Eye, a system management tool that continuously monitors server availability and performance. In the event of network errors, Alchemy Eye can alert the network administrator by cell phone or pager BEFORE problems get seriously out of hand. This helps protect your company's data and reduces the likelihood of costly network failures. If a server goes down, Alchemy Eye automatically notifies the network administrator and writes a detailed log file.